Nationality: British. Born: Edda van Heemstra Hepburn-Ruston in Brussels, Belgium, 4 May 1929, to a British father and Dutch mother. Education: Studied ballet at Arnhem Conservatory of Music, Amsterdam, and in Marie Rambert's ballet school, London. Family: Married 1) the actor Mel Ferrer, 1954 (divorced 1968), son: Sean; 2) Andrea Dotti, 1969 (divorced), son Luca. Career: 1949—stage debut in chorus of High Button Shoes , London; studied acting with Felix Aylmer; 1951—film debut in Britain in small parts in several films; chosen by Colette to play title role in Broadway production of Gigi ; 1953—American film debut in Roman Holiday ; 1954—on Broadway stage in title role of Ondine ; 1976—returned to films after long absence, in Robin and Marian ; 1988—Special Ambassador for UNICEF. Awards: Best Actress Academy Award, Best Actress, New York Film Critics, and Best British Actress, British Academy, for Roman Holiday , 1953; Best British Actress, British Academy, for The Nun's Story , 1959; Best British Actress, British Academy, for Charade , 1964; Commander, Order of Arts and Letters, France, 1987; Jean Hersholt Humanitarian Award, 1993. Died: Of cancer, in Tolochenaz, Switzerland, 20 January 1993. Interview in Photoplay (London), August 1982. Higham, Charles, Audrey: A Biography of Audrey Hepburn , London, 1984. Latham, Caroline, Audrey Hepburn , London, 1984. Woodward, Ian, Audrey Hepburn , London, 1984. Stresau, Norbert, Audrey Hepburn: ihre Filme, ihr Leben , Munich 1985. Maychick, Diana, Audrey Hepburn: An Intimate Portrait , Secaucus, New Jersey, 1993. Harris, Warren G., Audrey Hepburn: A Biography , New York, 1994. Hofstede, David, Audrey Hepburn: A Bio-Bibliography , Westport, Connecticut, 1994. Karney, Robyn, A Star Danced: The Life of Audrey Hepburn , New York, 1995. Vermilye, Jerry, The Complete Films of Audrey Hepburn , Secaucus, New Jersey, 1995. Walker, Alexander, Audrey: Her Real Story , New York, 1995. Paris, Barry, Audrey Hepburn , 1996. Krenz, Carol, Audrey: A Life in Pictures , New York, 1997. Byczynski, Stuart J., Audrey Hepburn: A Secret Life , Lawrenceville, 1998. Hepburn Ferrer, Sean, Audrey: A Son Remembers , New York, 1999. Keogh, Pamela Clarke, Audrey Style: The Subtle Art of Elegance , New York, 1999. Viotti, S., "Britain's Hepburn," in Films and Filming (London), November 1954. Simon, Brett, "Audrey Hepburn," in Films and Filming (London), March 1964. Braun, E., "The Hepburn Quality Revisited," in Films (London), August 1981. Thompson, F., "Audrey Hepburn," in American Film (Hollywood), May 1990. Obituary in New York Times , 21 January 1993. Wilson, Elizabeth, "Audrey Hepburn: Fashion, Film and the 50s," in Screen (London), March 1993. Corliss, Richard, "Serene Majesty," obituary in Film Comment (New York), March/April 1993. Collins, Amy Fine, "When Hubert Met Audrey," in Vanity Fair (New York), December 1995. O'Neill, Eithne, "Dans les boutiques du ciel: Audrey Hepburn et son costumier Hubert de Givenchy," in Positif (Paris), July-August 1996. When Audrey Hepburn died in 1993 at the age of 63, the world mourned a film star who on-screen and off embodied grace, elegance, and strength. At the pinnacle of her screen career, Hepburn gave her audience the perfect postwar combination of tomboy and sophisticate. After her semiretirement from film in the late 1960s, Hepburn held an honorary place among the Hollywood royalty. In 1988 she began her second career as a tireless special ambassador for the United Nations Children's Fund (UNICEF). Holly Golightly—whether dressed in a black Givenchy, enormous hat, and oval sunglasses hailing a taxi with a shrill whistle or in pigtails, sitting on the fire escape strumming "Moon River" on her guitar—epitomizes for many fans the essence of Audrey Hepburn's film career. Marked by the internal contradictions of big city sophistication and rural, childlike innocence, Holly appears fragile, yet by the end of Breakfast at Tiffany's the audience discovers her inner strength. Like Holly Golightly, Hepburn's past contributed greatly to the complexity and richness of her public persona. Hepburn was born in Belgium in 1929 to a Dutch baroness and an English banker who left when Hepburn was six years old. Trapped in Nazi-occupied Holland with her mother throughout World War II, Hepburn was reduced to eating tulip bulbs. She survived the war, but suffered many problems associated with malnutrition. The waiflike fragility which so many have admired and emulated was one result of wartime hardship. After the war, Hepburn moved to London where she studied ballet and worked as a dancer and model. Her film career began unnoticeably with several small parts in English movies. A chance meeting with the writer Colette landed Hepburn on Broadway in the title role of the hit show Gigi. She received critical acclaim, but was not chosen to recreate the role on-screen. (The role went to Leslie Caron who has similar physical attributes.) 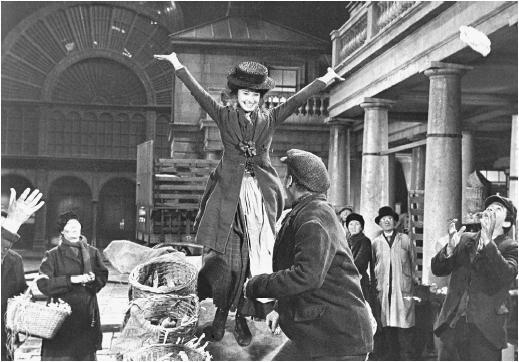 Two years later, in her first major U.S. film role as Princess Anne in William Wyler's Roman Holiday , Hepburn captured her audience's heart and won an Academy Award. Part of Hollywood's royalty, Hepburn played opposite the realm's most handsome charming princes—Gregory Peck, Humphrey Bogart, Cary Grant, Gary Cooper, Burt Lancaster, Henry Fonda, and Fred Astaire. That most of her leading men were older than her added to her gamine elegance and mystique. As Sabrina Fairchild, a chauffeur's daughter, Hepburn was torn between the smooth, handsome bachelor played by William Holden and his serious, businesslike older brother (Humphrey Bogart). Following her heart, Sabrina makes the right choice. Audrey Hepburn's characters would continue to make the heart's choice in all her bestloved movies. Her audiences loved and trusted her because she played characters whose hearts, if occasionally misguided, in the end were true and kind. Sabrina also marked the beginning of Hepburn's lifelong intimate friendship with the French fashion designer Hubert de Givenchy. She considered Givenchy one of her best friends and he has referred to her as a sister. He designed most of her screen clothes and she wore his designs offscreen as well. The clothes he designed for her almost always accentuated her long neck and showed off her strong shoulders. The Hepburn/Givenchy look countered the torpedo-breasted voluptuousness of the 1950s ideal woman. Hepburn gave women the possibility of a dignified, comfortable look in which intelligence and wit matter as much as physical beauty. Princess Anne, Sabrina, and Holly Golightly share qualities with all of Audrey Hepburn's roles: as the daughter of a private detective in Love in the Afternoon , an empathicist bookseller turned photographer's muse in Funny Face , a typist in Paris When It Sizzles , and the daughter of an eccentric art forger in How to Steal a Million , Hepburn charmed with her gamine elegance, her chic wardrobe, her indistinctly European accent, her intelligent, simple beauty, and her wide, expressive eyes. With The Nun's Story , The Children's Hour , and Two for the Road , she successfully attempted grittier roles. Her 1967 portrayal of Suzie Hendrix, a blind woman trapped by a killer in Wait until Dark , proved Hepburn capable of an edgy, tensile performance. During her semiretirement following Wait until Dark , Hepburn returned to the big screen a few times, most notably perhaps in her critically acclaimed role opposite Sean Connery in Robin and Marion. Hepburn's two-decade reign as one of Hollywood's most extraordinary stars seems almost a fairy-tale interlude in a life ravaged by war and then spent serving others similarly ravaged. A former recipient of UNICEF relief aid, she considered her role as UNICEF special ambassador one of the most important in her life. Her final film appearance as Hap, the romantic angel in Steven Spielberg's Always , left us with a screen image of what Hepburn always was—a serene, radiant presence with force of spirit whose effortless elegance and sovereignty inspires us all.